The global laser plastic welding market was valued at US$ 758.9 Mn in 2016 and is expected to be valued at US$ 1,543.2 Mn in 2025. The global laser plastic welding market is characterized by material processing machinery manufacturers innovating in terms of welding methods, laser source and automation in order to cater to intensely competitive manufacturing machinery market. Laser plastic welding system manufacturers are also realizing the significance of introducing innovative technology as part of their branding and marketing strategies. Increasing consumer preference for aesthetically compelling products has driven the demand of laser plastic welding due to its capability of performing welding operation in the hidden surfaces. Various developments in the methods of the laser plastic welding has increased flexibility in the required condition for plastic welding and resulted into expansion of the market into various industries for multiple applications. The global laser plastic welding market is expected to expand at a CAGR of 8.3% in terms of market value over the forecast period 2017-2025. The global market is observed to generate revenues primarily driven by automotive, electrical and electronics, and healthcare industry. On the basis of system type, the global laser plastic welding market is segmented into standalone systems and integrated systems. In terms of global volume, integrated systems segment is anticipated to account for slightly higher share than the standalone systems segment and forecasted to move towards equilibrium to reduce the difference in market shares of the two segments. Due to comparatively low prices of standalone systems, lying into the affordable range for the emerging manufacturers has resulted into the higher pace of growth of the standalone systems segment. On the basis of method, the market is segmented into contour, quasi-simultaneous, simultaneous, mask, radial and others. The others segment includes various methods recently developed by few key players of the market such as roller welding, globo welding and hybrid welding. Contour welding is the simplest method widely incorporated in various industries for two dimensional welds. Mask welding is widely preferred by electronics industry due to its capability of precisely weld the components without damaging the sensitive components near the welding region. The methods within the others segment are presently in introduction stage and has limited applications restraining the growth of the segment, although, expected to rise at considerable pace due to introduction of the technology to the new industries. On the basis of end-use industry, global laser plastic welding market can be segmented as electrical and electronics, healthcare, automotive, consumer goods and other industries. Automotive industry is estimated to contribute with the largest share of 48.9% in global laser plastic welding market in 2017 while the healthcare segment is expected to expand at the highest pace with a CAGR of 10.9% over the forecast period. The global laser plastic welding market is segmented geographically into five key regions including North America, Latin America, Europe, Middles East and Africa (MEA) and Asia Pacific (APAC). Accounting for the dominant share of 42% in 2017, Asia Pacific emerged lead in the global market. Expansion reported by the automotive and electrical & electronics industries across Asia Pacific will support the market’s growth in the region through the forecast period. Besides this, lucrative prospects are likely in Europe. The presence of a large number of machinery manufacturers will enable growth in the laser plastic welding market in Europe. Some of the players operating in the global laser plastic welding market include TRUMPF GmbH + Co. KG, Han's Laser Technology Industry Group Co., Ltd, LPKF Laser & Electronics AG, Jenoptik AG, Emerson Electric Co., Nippon Avionics Co., Ltd., Rofin Sinar Technologies Inc., Leister Technologies AG, Amada Miyachi Co. Ltd., DILAS Diodelaser GmbH, CEMAS Elettra S.R.L., Dukane IAS LLC, Control Micro Systems, Inc., Bielomatik Leuze GmbH + Co. KG, O.R. Lasertechnology GmbH, Seidensha Electronics Co., Ltd, Sahajanand Laser Technology Ltd., Scantech Laser Pvt. Ltd. and Wuhan Chuyu Optoelectronic Technology Co., Ltd.
Transparency Market Research examines the global laser plastic welding market for the forecast period 2017-2025. The primary objective of the report is to identify opportunities in the market and present updates as well as insights pertaining to various segments of the global laser plastic welding market. 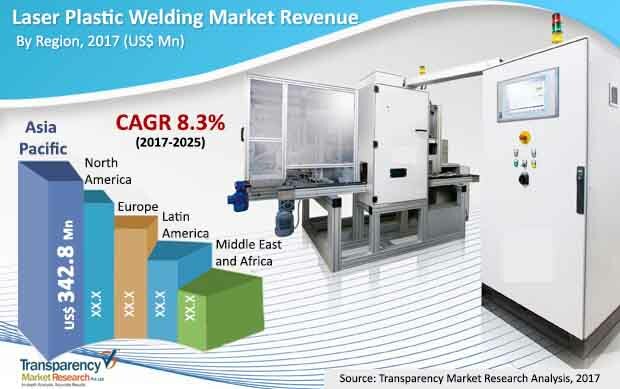 The report begins with an overview of the global laser plastic welding market, evaluating market performance in terms of revenue, followed by TMR’s analysis of key trends, drivers, and restraints witnessed in the global market. Impact analysis of the key growth drivers and restraints based on the weighted average model is also included in the report. To compute the market size, in-depth secondary research is done. Data points such as regional splits and market split by system type has been assimilated to arrive at appropriate market estimates. The report comprises the forecast of the global revenue generated by the business in laser plastic welding market. TMR triangulates the data via different analysis based on supply side, demand side as well as the dynamics of laser plastic welding market. Market numbers have been estimated based on extensive secondary and primary research, average pricing of laser plastic welding by system type and the revenue is derived through regional pricing trends. Market size and forecast for each segment have been provided in the context of global and regional markets. The laser plastic welding market has been analyzed based on expected demand. Prices considered for the calculation of revenue are average regional prices obtained through primary quotes from numerous regional laser plastic welding manufacturers, suppliers, and distributors. All key end users have been considered and potential applications have been estimated on the basis of secondary sources and feedback from primary respondents. Country demand patterns have been considered while estimating the market for various end users of laser plastic welding in the different regions. Bottom-up approach has been used to estimate the laser plastic welding market by regions. Global market numbers by system type, by method, by laser, by application and by end use industry have been derived using the bottom-up approach, which is cumulative of each country’s demand. The same has also been validated from top-down approach. Company-level market share has been derived on the basis of revenues reported by key manufacturers. The market has been forecast based on constant currency rates. Vital feature of this report is the analysis of the laser plastic welding market by region, system type, method, application, laser and end-use industry; and the corresponding revenue forecast in terms of incremental dollar opportunity. This is traditionally overlooked while forecasting the market. However, incremental dollar opportunity is critical in assessing the level of opportunity that a provider can look to achieve as well as to identify potential resources from sales perspective of the global laser plastic welding market. To understand key segments in terms of their growth and performance in the laser plastic welding market, Transparency Market Research has developed a market attractiveness index. The resulting index should help providers identify existing market opportunities in the global laser plastic welding market. In the final section of the report, laser plastic welding market competitive landscape is included to provide a dashboard view of companies that manufacture laser plastic welding. The report contains company profiles of some of the players in the global laser plastic welding market. Some of the players operating in the global laser plastic welding market include TRUMPF GmbH + Co. KG, Han's Laser Technology Industry Group Co. Ltd, LPKF Laser & Electronics AG, Jenoptik AG, Emerson Electric Co., Nippon Avionics Co., Ltd., Rofin Sinar Technologies Inc., Leister Technologies AG, Amada Miyachi Co. Ltd., DILAS Diodelaser GmbH, CEMAS Elettra S.R.L., Dukane IAS LLC, Control Micro Systems, Inc., Bielomatik Leuze GmbH + Co. KG, O.R. Lasertechnology GmbH, Seidensha Electronics Co., Ltd, Sahajanand Laser Technology Ltd., Scantech Laser Pvt. Ltd. and Wuhan Chuyu Optoelectronic Technology Co., Ltd.